There's a lot of good things about using Craigslist. No fees, no commissions and no worrying about buyers leaving negative feedback. All good stuff. Sometimes though, CL buyers leave you with other not-so-good stuff...like engine fluids in front of your house! 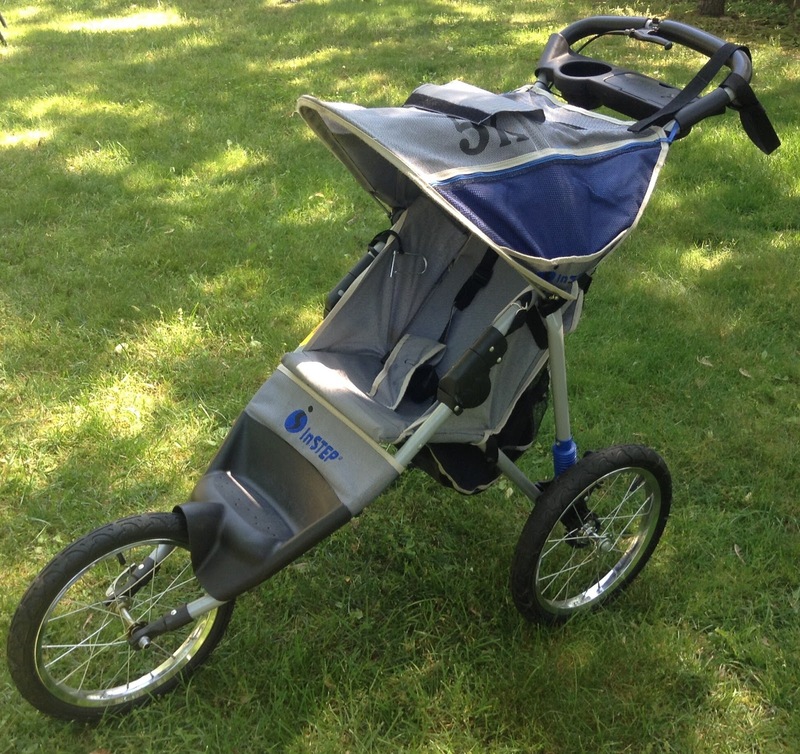 The other day I made a nice flip with a CL buyer who came by the house to buy an "Instep" Jogging stroller. Although I prefer to meet CL buyers at locations like the post office or a store parking lot, I've been lazy lately and have been telling buyers to come right to my house. But after the jogging stroller deal, I am remembering why it's better to meet buyers in a parking lot. InStep Strollers are big sellers! on Craigslist that evening for $80. A few days later, I had a young Dad pulling up to the house to buy it. He parked at the curb and jumped out with his five year old son in tow. I happened to be outside, so I wheeled the stroller out in the driveway so he could check it out. The stroller was in excellent shape and I fully expected the whole transaction would take no more then five minutes. But the young Dad took his time, carefully examining the stroller over and over again. He kept fiddling with it, asking questions, then fiddling with it some more. It seemed like he was stalling for time in order to work up the nerve to lowball me! As the fiddling continued, his five year old became increasingly bored and agitated. At this point I was starting to get agitated too. I've had doctor's examinations that took less time then this! Finally after popping every lever and rolling the stroller around and around in my driveway, young Dad asked if I would take $70 for it? Maybe it was all part of his strategy, because I accepted his offer without even countering. I just wanted to close the deal and get the guy out of my driveway. Besides, a $45 profit is a pretty good payday for me! Young Dad slapped $70 in my palm. He then grabbed his son and the stroller and headed back to his big Dodge truck. Then it got a little weirder. If you're like me, you want the buyer leaving as soon as the transaction is over. In fact, most folks know there's an "understanding" between buyers and sellers. Once the deal is made....no chit-chat, no long goodbyes or other time wasters. Grab your stuff and go! But apparently this guy didn't get the memo. Instead, he sat in front of my house for over 20 minutes! I watched from the window as he continued to dawdle with the stroller at my curb. For some odd reason he was trying to remove the stroller's front tire. And it wasn't because the stroller wouldn't fit....the guy was driving a huge truck and could just toss it in the back with no problem! This was all a head scratcher to me. My buyer leaves me a gift! So as the minutes ticked by, I became more annoyed with young Dad camping in front of my house. It didn't help that my dog kept barking at the guy. Finally, I decided to walk some trash down to the curb and shoot him a look just to create an awkward moment. This seemed to do the trick and after a solid twenty minutes, young Dad finally cranked over his truck and pulled away. But he left me something to remember him by. His truck was leaking fluids, leaving a huge stain right by my mailbox...thanks buddy! This wasn't my first rodeo with a "memorable" CL buyer. About a year ago, a young couple came by the house to buy several boxes of leftover floor tile. While I made some nice money on the transaction, I thought I was going to have to feed and shelter the couple for the night! After making the deal, the hapless couple couldn't get their car started. Instead, they sat in front of my house during a steady rain trying to crank over the car's engine. From the sound of the clicking noise coming from under the hood, it was clear their car battery was dead. Hoping to get them on their way, I suggested to the husband that I give his battery a jump using my truck. For reasons only known to him, the guy turned me down insisting he'd get the car started on his own. He then proceeded to crawl under the car, literally pounding on the crankshaft with a wrench. The metal bangs from each blow echoed down my street, causing some neighbors to look out their front windows. I am no auto mechanic, but this was the equivalent to attempting to fix a car engine by inflating the tires...it had nothing to do with the problem! After nearly an hour off intermittent banging, the guy finally agreed to let me jump his battery. I pulled the truckster up and hooked up all the jumper cables. Thankfully, his engine cranked over and roared to life! I was glad to see him finally go, but like the young Dad, he left a nice oil stain on the street! All of which reinforces my belief that when dealing with Craigslist buyers, you're usually better off meeting them anywhere but your house...unless you enjoy strangers hanging at your place! I only recently started selling on CL and have not had any problems. But I learned my lesson when I listed a bookcase in Freecycle. I got an immediate response from someone who said they'd be right over. Well, the bookcase was still in my living room when he came by. Since it was free, I figured he'd be in & out. But NO, he was a talker and had plenty of time on his hands. I couldn't get him to leave. I finally asked my son to help him move the case to his truck and I too walked out closing the front door behind me. So when I started selling on CL, I made it a point to show the items in my garage which faces the front street. So far, no car problems ... knock on wood! Good call....I use the garage tactic too. Never want to let a stranger inside the house. You just never know, right? Those "talkers" can be brutal! Sometimes it seems like some folks are looking to make a new friend. You just want to say, "Here's the stuff, now take it and get out!" HA! Hmmm, very interested in reading about your nightmare...you got me intrigued! BTW, I too recently sold a jogging stroller. I made a huge error and that transaction turned into a financial nightmare. I'll be posting my story of shame in a few days! OMG! Something similar happened to me! I listed some pool toys on Freecycle and had them in my garage (like Ms GH suggested). The person showed up and pulled her car into my driveway. I was standing right there. She left the car running, got out of the car, the door closed and we heard "click." The doors automatically locked! She didn't have a push button car entry so she was locked out of her car (keys and cell phone inside). She had to come into the house and use my phone to call her husband and wait (it was cold out). Meanwhile the car continued running and it started to overheat because the fan wasn't working. My husband had to put a portable fan in front of the grill because the car was smoking! When her husband finally showed up, he was really mad. Eventually the car cooled down and they left but the whole thing lasted well over an hour. When I see her email in response to a FC listing, I skip it. Everyone else has been super with no problems, but from now on, if it's small, I'll meet them at Burger King instead. Lorraine I-Yi-Yi,,,,talk about a nightmare! It was like a series of disasters all in your driveway! I can keep it together for a little while, but after an hour I may have lost it on the lady, sheesh. That's the good thing about meeting at a Burger King or post office, you can just pull away and they can deal with the problem. HA! That really is a good idea to meet them anywhere BUT your home - IF the size of the item is easily transported. A little too creepy have "unknowns" hand around too long - just too many wackos out there these days. Susie Q-Agreed, there are some big things where you have no choice but have them come to the house. As commented above, that's when I bring the item into my garage, cause the buyer ain't coming inside the house! On avoiding the wackos, my niece sells on CL and meets people out a local courthouse where there is always a police officer around. Another good location would be the local police department. Can't hurt, right? I think most craigslist sellers have similar stories, it just comes with the territory. Here's mine: I listed a bedroom mirror, dresser & chest. Lady wanted to come. My hubby wasn't home but I said yes. These items were in my house as my garage has been converted and is no longer a garage. Lady and her husband got here quite tipsy. Lady needed a bathroom asap (they'd been drinking tall fruity cocktails on the way) and husband wanted to see the furniture. The second I realized they had split up inside my house, I got scared. It all turned out okay after an hour of helping them bungee cord these bulky pieces of furniture to the top of their CAR but I learned my lesson. If my hubby isn't home and I can't find a way to get the item outside, I cannot set time for buyers to stop by, I wait till hubby is home. GreenJeans- I could imagine those two tying down the furniture while they're tipsy-could take forever...HA! But Excellent safety point as far as waiting for your husband to be home. Better safe then sorry. I think I've got you beat dude - this past weekend we had a yard sale, just to get rid of some stuff before I dragged it to Goodwill. Yard Sale was a bust, but this family pulls their busted old Explorer INTO the driveway (streets was wide open, no one around) - where the alarm starts going off nonstop. For 30 minutes it is going off embarrassing me to no end. Finally get the guy to push it out to the street where alarm still going off - I disconnect his battery. They were there for two hours. The mom and kid (same age as my kid) hung out (and had to take the kid in my house multiple times to potty). Finally somebody came and dragged their broke down truck home. And it seems that my kid got pink eye from the kid. And we made a measly $60 for all day. I just wish I had taken it all to the dump and saved my Saturday and my sanity. Dave- That's definitely the best of the worst! It's almost like you adopted the family for the day-yipes! And what is it with these obnoxious people who pull into a driveway when your holding a yard sale? I've seen that a few to many times and could do a whole blog on that behavior...it's just ignorant! Thanks for sharing. You may have convinced all my readers to never host another yard sale again. Ha!....Dude! The middle of the road or the 3 feet from the curb/blocking traffic are the worse! Garage sale gridlock-HA! We had our driveway sealed a few years ago and two days later had a garage sale. Our driveway is about 3 cars long and is uphill. One of the very first customers pulled right into the driveway as close to the stuff as they could get, bought nothing and left, but like your customer, left a huge puddle right in the middle of the driveway. It was quite annoying. Wendy-People are unbelievable aren't they? The pull into the driveway move takes a lot of nerve, totally ignorant. I've never used Freecycle, but have heard about it. When I am looking to unload something I just list it under the "free" section of CL. The people who kill me are the ones who e-mail you asking to hold the item, then never show up. So I don't commit to holding anything anymore, they can take their chances. One guy actually chewed me out in an e-mail when he he was beat to the curb for one of my freebies. Unbelievable these people! Check out my Craigslist blog piece above & tHanks for writing in....Dude! The key to listing "Free Curb" items on Craigslist (which I too have done many times) is you don't offer any contact information and you turn off the Craigslist e-mail thing. Just state in the auction that you'll pull the posting once the item is taken. So I know this is from a while back but I had to comment. A friend asked us to help her sell a ton of golf clubs and gold shoes (she use to own a store) and to make it easier we stored them in our shed. So this guy wanted to see them and since we had over a hundred clubs and a ton of shoes in the guys size I just had him come over plus it was all in my shed no issue right.. My boyfriend is pulling them out of the shed as he pulls up and even though we laid out all the clubs on the table the moment my boyfriend turned his back to look through them for a specific club the guy asked about, the guy went into our shed luckily I was upstairs with my friend (we had gone up after the man made comments about how women arent useful at all, mind you this was after I told my BF I would be right back after I got water we had been out at the flea market selling all day and I was thirsty) and we were watching out the window, I came out of the house acting like I was just bringing water down and gave the man my best Im not going to be rude but get the H out of my shed look and said theirs nothing in there sir its all out here. He got out and I locked the shed, he ended up trying to low ball us, but we sold a few things and he finally left. After that didnt matter if I had to load my car full (which I did at one point cause I ended up getting sick of it and selling the shoes to a guy for way too cheap to get them off my hands long after our friend told us just to keep them cause she didnt care any more). Lesson learned I always meet at the local Starbucks now or somewhere public..
On the meeting in public thing, I cant stand when people want me to meet them at Walmart, of all the crowded places why there Im always like there are fast food joints near all the Walmarts that are not near as crazy Ill meet you there but not Walmart lol. Kai- Great story! Sounds like the guy was a real jerk! This topic seems to have gotten under a lot of people's skin. I guess because we've all had an occasional CL idiot to deal with. I like your story so much, I am going to tweak it and make it part of my next blog piece. It's timely, because I just had a sour experience with a CL buyer which really ticked me off. Thanks for writing in and sharing the story...Dude!